My head is spinning with our never-ending computer problem chaos. This week the problem is can’t load my pictures from my camera, and some of the software is not working. I’ve been avoiding the computer all week. Long story and no it’s not a virus. Just old. It’s been going on for, let’s see, umm…years. I want to get this computer. But the hubby refuses. Back and forth, back and forth. We’ve not budge from our separate opinions. Well, okay I guess I have because it’s been such a week of headaches that I went and randomly bought a computer without him knowing. But it’s one he would approve. So, he got his wish. However, I did tell him that I’ve not put my foot down on the computer I want. Oh, yes I will get that one day.very soon. 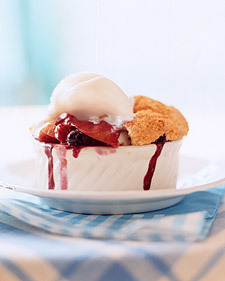 In the meantime, I did make a scrumptous, mouth-watering, give-me-seconds peach AND blueberry cobblers. 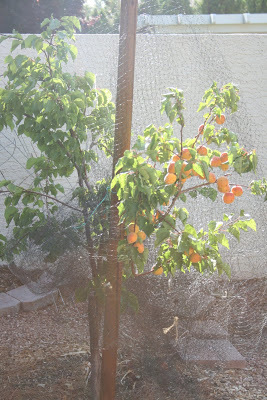 All the fruit hand picked by my children’s little hands. A few people have asked for the recipe, so here it is but just so you know I cheated. Preheat oven to 350. Grease 9×13 baking pan. In saucepan, stir together sugar, flour, lemon juice and water. Combine well. Stir in blueberries. Turn heat to med-high. Stir until mixture boils. Pour into pan. Sprinkle top with cake mix. Then pecans. Then cinnamon. Drizzle butter over top. Cover as much as possible. Bake for 45-50 minutes. Serve with homemade whipped cream. To make peach cobbler: I omited the flour, lemon juice and water and added two tablespoon of cornstarch and 1 teaspoon of ginger. 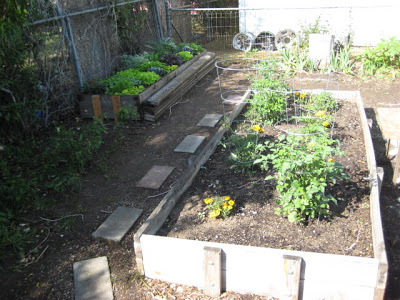 I am yearning for my own vegetable garden. I want to be able to walk out of my kitchen, grab all the vegetables I need for our nightly dinner salads. 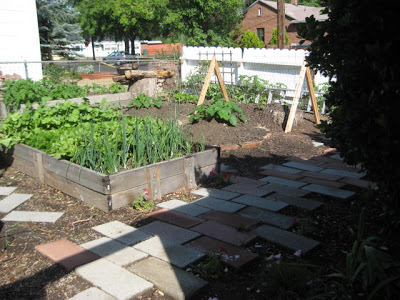 This summer was suppose to be the year I got my act together and built vegetable boxes and planted seeds. I even have the spot picked out in my backyard. Lack of time has been my enemy. Perhaps potted vegetables will do. In the meantime I’ve been enjoying my mom’s garden of herbs, onions, tomatoes, eggplant and a variety of fruit. 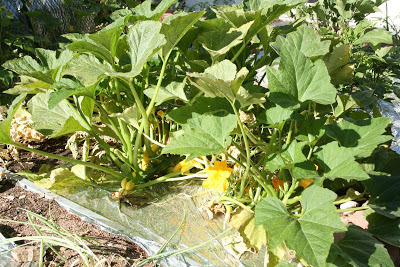 And my girlfriend Lauren sent me pics of her vegetable garden that is in full bloom bursting with edibles. This weekend has been a domestic one. 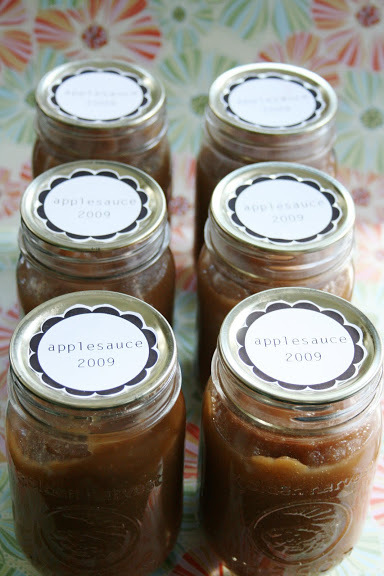 I’ve been busy in the kitchen baking, cooking and canning–with in between breaks of elevating my feet. 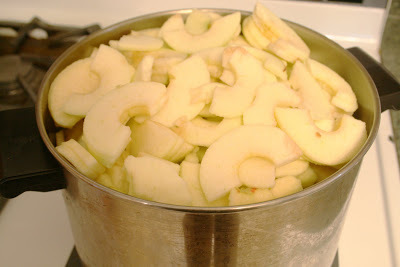 I had this huge bag of apples, we picked the weekend before, and needed to use as many up before they started spoiling. So I baked a really yummy apple pie (that’s already almost gone!) 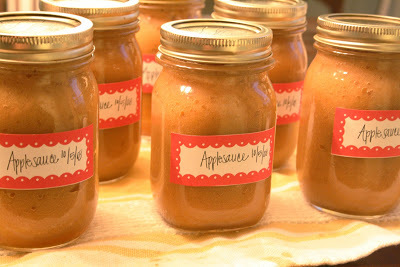 and jarred applesauce. In addition to our large breakfast we have on conference morning. 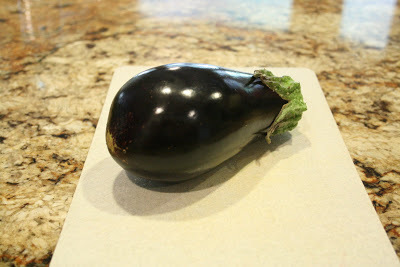 Seth brought home the other day an eggplant and chile peppers from a co-worker’s garden. So tonight for dinner I made our favorite eggplant salad. This dish makes my mouth water. 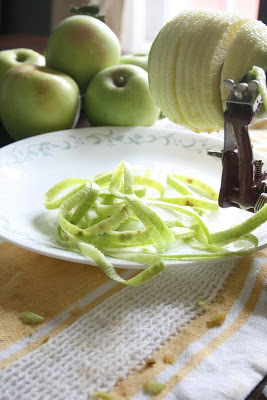 It’s so yummy, fresh and easy to make. Grilled vegetables work best so it’s ideal for summer or the winding-down warm evenings. To prepare dressing, combine first 6 ingredients in a bowl; stir well with a whisk. To prepare salad, combine tomatoes and dressing, and set aside. Sprinkle eggplant with 1/8 teaspoon salt. Place eggplant on a grill rack or broiler pan coated with cooking spray; cook 5 minutes on each side or until eggplant is done. 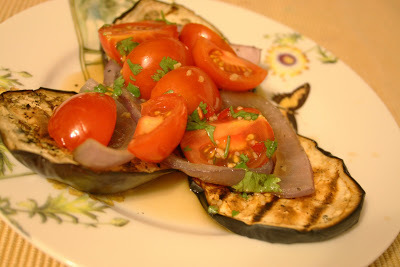 Remove eggplant from grill rack or pan; set aside. Sprinkle onion with 1/8 teaspoon salt. Place onion on grill rack or broiler pan coated with cooking spray; cook for 5 minutes on each side or until onion is tender. Arrange eggplant and onion slices on 6 plates. Top with tomato mixture; sprinkle with mint and basil.